Recovering from a super Women’s Open Mat this afternoon. 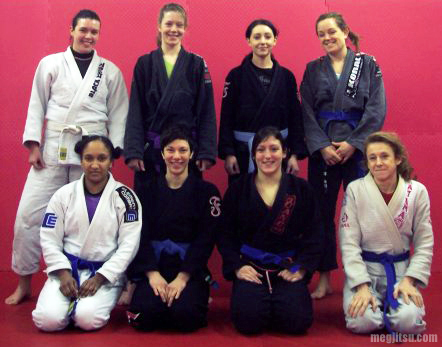 This is the third event we’ve organised at Dartford BJJ and unlike previous events, most of the eight participants were more seasoned players; big props to new white belt Rebekka Francis for getting stuck in with the blues and purples (check her review here)! Two of the grrlz, fresh and super pumped from Saturday’s Ana Maria India seminar, were keen to share with us/reinforce for themselves some of the half-guard techniques they worked at the seminar, and we drilled a progression of techniques from the half guard. The second half of the session was spent sparring. We warmed up with a ten minute roll and followed this with one of the participant’s suggestion of ‘King of the Hill’ (or should that be ‘Queen’) sparring. This entailed two women getting into the middle of the mats, while the rest of us rotated between them for two minute rounds. We topped off the afternoon with two five minutes rounds of sparring. 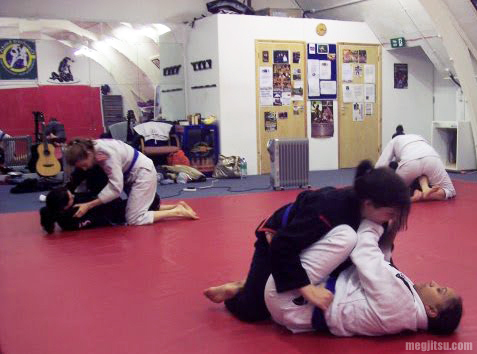 As our visitor from Leicester commented, the calibre of the women’s games was high and it was an excellent opportunity to discuss different approaches to common BJJ problems, in particular getting hooks in for taking the back. 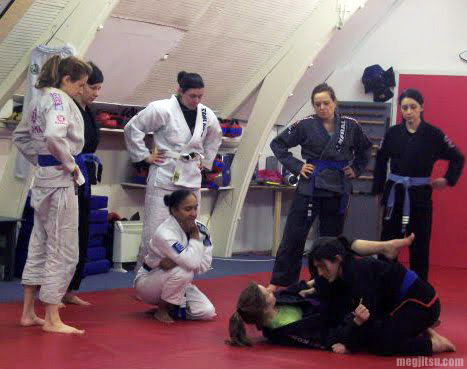 We are looking forward to organising more opportunities for women to roll with one another, and while other participants are hoping to host events at their clubs, Dartford BJJ is pleased to announce a Women’s Open Mat on 6 June. In response to recent inquiries, this event will be split between gi and no gi training. More on this to follow. Lastly, I broke in my new Fenom Kimono. First impressions are very good on this nicely cut, exceedingly soft gi and a review is forthcoming. Thanks again, ladies, for making the Open Mat all that it is and I look forward to seeing you all on the mats again soon. Sounds like fun! Especially the "Queen of the Hill"! It was great fun, A.D.! Was a cold, miserable day and I am so grateful to the women who turned out for it. An incredibly sisterly group; never ceases to amaze me how these folk that meet each other at competition put it all aside and just want to learn to be better players. Is inspiring! When something hasn't yet reached a critical mass (like women in BJJ), I don't think it's discriminatory for an event to focus on solely that group until it has. I guess you could sort of make a comparison to all-women shortlists in politics, as part of an effort to bolster the still distressingly low numbers of female MPs. Obviously lots of other issues involved in that particular example, but same goal: increase representation. I agree with @slideyfoot It's support, not sexist, precisely because without that support the default is men only. Slideyfoot wrote so much on women in BJJ that at first I thought he was a woman.